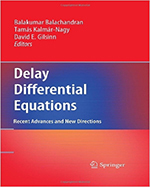 Delay Differential Equations: Recent Advances and New Directions cohesively presents contributions fromleading experts on the theory and applications of functional and delay differential equations (DDEs). Researchers will benefit from a unique focus on theory, symbolic, and numerical methods, which illustrate how the concepts described can be applied to practical systems ranging from automotive engines to remote control over the Internet. Comprehensive coverage of recent advances paired with analytical contributions are included, in addition to computational techniques and illustrative examples of the application of current results drawn from biology, physics, mechanics, and control theory. This text dedicates a full chapter to the calculations of delay differential equations using Maple. The Maple examples help to clarify complex concepts by delivering step by step solutions to the problems that are presented.